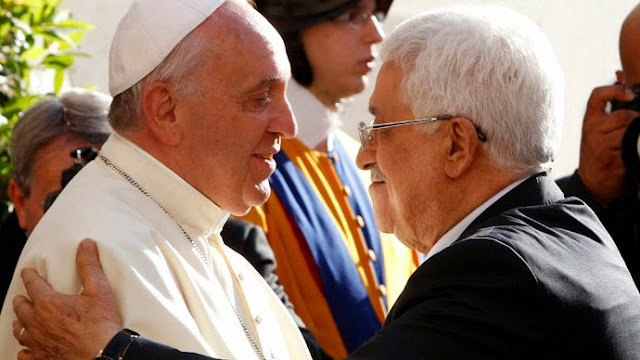 Vatican Officially Recognizes "State of Palestine"
There is no "State of Palestine" at this time. This is part of the ongoing pressure upon Israel to create one. Creating one will be a great victory for the global jihad force, as a "State of Palestine" will inevitably be a new jihad base for renewed attacks against what remains of Israel. Events will unfold just as they did when the Israelis withdrew from Gaza: while the international media hailed a new era of peace, the "Palestinians" gutted installations and prepared for jihad. This recognition could end up being as large a blot on the Catholic Church's record as the Inquisition and the many Catholic clerics all over Europe who went along with the Nazi program against Jews during World War II. The "Palestinians" make no secret on official PA TV of the fact that they share that same genocidal antisemitic bloodlust. This recognition only validates that bloodlust, and enables it. (AP)—The Vatican officially recognized the state of Palestine in a new treaty finalized Wednesday, immediately sparking Israeli ire and accusations that the move hurt peace prospects. The Israeli foreign ministry said it was "disappointed" by the development. "This move does not promote the peace process and distances the Palestinian leadership from returning to direct and bilateral negotiations," the ministry said in a text message. "Israel will study the agreement and will consider its steps accordingly."